UPMC Summer Associates are provided with awesome opportunities in and out of the office. One such opportunity is the departmental service project. As Service Chair for the Marketing/Communications and Public Relations/Media Relations departments, I was responsible for arranging a service project with one of UPMC’s community partners. It was unanimous! Our department wanted to volunteer with animals. Therefore, one Friday afternoon, 13 of us traveled to Animal Friends, a non-profit companion animal resource center. 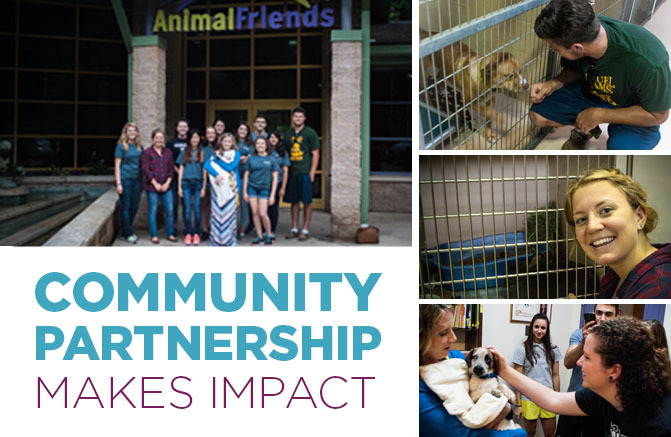 UPMC and Animal Friends became community partners in January 2013 through a generous charitable donation to fund Animal Friends’ pet therapy program. The pet therapy program is designed to provide people with animal companionship and bring smiles to their faces. “Therapets,” as the animals are known, visit patients in hospitals, college students during final exam periods, and so on. After learning more about this great program that UPMC partners with, it was only fitting that we, as UPMC volunteers, get involved. As a group, we created informational packets for Animal Friends’ Therapet volunteers, to be displayed in their newly added educational library. For the second half of our service project, we went on a tour of the Animal Friends facility, gaining a behind-the-scenes look at their operations. During the tour we were able to visit with the shelter’s rabbits, play with the cats, and feed treats to the dogs. Our tour concluded with a visit from a new furry friend, a two-month old puppy named Piper! Overall, our time at Animal Friends was a great way to spend the afternoon away from the office. Witnessing UPMC’s existing impact on the Animal Friends organization, made me happy that our department could contribute to and participate in the partnership.